Your pup will look fashionable and feel cozy in the Londoner Plain Mock Neck Dog Sweater in Red. 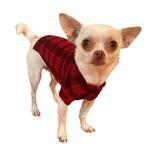 This red plaid mock neck sweater will have your dog ready to stroll the streets of London looking like a local! Tartan plaids are ruling the runway this year, especially in classic red and black. The Dog Squad’s Londoner Plaid mock turtleneck is an essential part of any fashionista's wardrobe this year! Always a classic choice through the holiday season too. Made of cotton, nylon, and spandex so it holds its shape after washing. Londoner Plaid Mock Neck Dog Sweater by The Dog Squad - Red Customer Photos - Send us your photo! Auzzie was not happy with all the snow we received here in Vernon, but He's got his sweater I purchased from Baxterboo and his camo coat. Thinking we need some booties, "momma my feets are cold"
Posted On 01/23/19 by Carol A from Tampa Bay, FL Yes, Carol A recommends this product! Coty loves this sweater, and insisted on wearing it in the house when we tried it on for size! I originally ordered a medium, but found it was too long for his body. Reordered in a small and it fits perfectly. Excellent quality, service and reasonably priced products. This is my second order from Baxter boo and again I'm very satisfied with my order. the kids love them too!